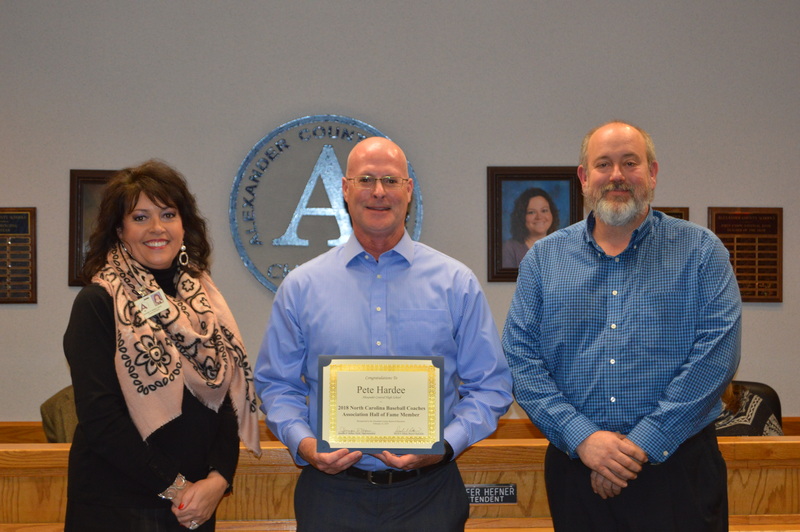 Alexander Central High School Baseball Coach Pete Hardee has been recognized by his peers for one of the most prestigious honors a coach can receive. Coach Hardee was inducted in the North Carolina Baseball Coaches Association Hall of Fame during the 2018 Coaches Convention held in Greensboro Friday, Dec. 7. Hardee joined the ACHS coaching staff in 2015 and has led Varsity Cougar Baseball for the past three seasons. Last spring, Hardee picked up his 400th career win in a Cougar victory over Western Harnett, which is coached by Coach Hardee’s son. In his career, Hardee has amassed a 407-317 high school coaching record as the bench boss at West Caldwell, New Bern, Watauga, and now Alexander Central. Before joining ACHS in 2015, Hardee spent 21 seasons in Boone as the head coach of the Watauga Pioneers. Coach Hardee’s teams have captured 10 conference titles and earned 17 postseason playoff positions. In addition to coach high school baseball, Coach Hardee has served as the American Legion skipper for Caldwell County, New Bern, Watauga, and Taylorsville. He has compiled a 110-85 coaching record in legion baseball. Hardee was a standout baseball player at New Bern High School and Appalachian State University. He is a member of the Hall of Fame at New Bern and ASU. He posted 21 pitching wins in the mound career at Appalachian State and posted an impressive 12-1 record in 1984. His 1.07 earned run average in 1984 was the second best in the nation. His effort resulted in All Conference, All-District, and All-American honors for the Mountaineer pitcher. Following his collegiate career, Hardee was a 22nd round draft pick of the Montreal Expos in 1984.